Are you confused by all those connections on the back of your Home Theater, AV, or Surround Sound Receiver? We have the solution. The following guide provides close-up images with associated explanations that will enable you to get comfortable with the types of connections a Home Theater Receiver has, and what they are used for. The type, number, and placement of connections may vary by brand and/or model. On "modern" home theater receivers (aka AV receivers or surround sound receivers), HDMI is the most important connection. It is where you connect all of your HD or 4K source devices, including Blu-ray/Ultra HD Blu-ray Disc players, cable/satellite Boxes, media streamers, and game consoles. Home Theater Receivers usually have four or more HDMI inputs and a least one output that connects to your TV or video projector. However, some home theater receivers may have two or three HDMI outputs, similar to the example shown above. Multiple HDMI outputs allow you to connect the receiver to more than one TV or video projector. Depending on brand and model of receiver, you may be able to watch the same or different sources on more than one TV or video projector. HDMI inputs and outputs pass both audio and video and enable additional capabilities such as HDMI-CEC and HDMI-ARC (Audio Return Channel). Home Theater Receivers include two-types of digital audio-only connections, Optical and Coaxial. You use these to connect audio from most DVD, Blu-ray Disc players, and HD and 4K Ultra HD TVs. Also, some CD players provide one, or both of these output options. These connections will access 2 channel stereo and standard Dolby Digital and DTS surround sound signals, but they cannot pass the more enhanced surround formats, such as Dolby Digital Plus, TrueHD, Atmos, or DTS-HD Master Audio or DTS:X. Those are only accessible via HDMI connections. Although most audio is now available digitally, there are still a lot of devices that either uses analog exclusively (such as vinyl record turntables, audio cassette decks, and VCRs) or provide it as an alternate audio connection option (using RCA style jacks and cables) on other devices, such as TVs, cable/satellite boxes, DVD and Blu-ray Disc players. Another audio source included in home theater receivers is radio reception. Most home theater receivers provide connections for both AM and FM antennas. However, there are some home theater receivers that only provide FM Antenna connections as they may not include an AM tuner. You can't hear the sound from a home theater receiver unless you connect some speakers. Some speaker terminals may provide more than one channel option (not at the same time though). For example, if are trying to accommodate a different type of speaker setup (such as for Dolby Atmos, DTS:X, Auro 3D Audio, or a powered 2nd Zone), refer to the added illustrations in the provided user manual to find out what terminals to use and how to assign them correctly. In addition to connecting the correct speaker channel, make sure the polarity (+ -) is correct: Red is (+), Black is Negative (-). If the polarity is reversed, the speakers will be out-of-phase, resulting in inaccurate surround sound and poor low-frequency reproduction. On home theater receivers that offer it, the Zone 2 feature allows a second source signal to be sent to speakers or a separate audio system in another room via a wired or cable connection. Zone 2 functionality allows you to watch a Blu-ray disc or DVD movie with surround sound in the main room while someone else listens to a CD player, AM/FM radio, or another two-channel source in another room at the same time. All the source components are connected to the receiver and are accessed and controlled separately with the receiver's remote. Another type of speaker needs to be connected to a home theater receiver is the subwoofer. However, instead of connecting to the terminals provided for the rest of your speakers, the subwoofer connects to an RCA-type connection that is labeled: Subwoofer, Subwoofer Preamp, or LFE (Low-Frequency Effects) output. This type of connection is used because subwoofer have their own built-in amplifiers, so the receiver doesn't have to power the subwoofer, only supply the audio signal. RCA-style audio cables are used for this connection. All home theater receivers provide at least one subwoofer output, but many may also provide two as shown in the above example. This provides added setup flexibility. 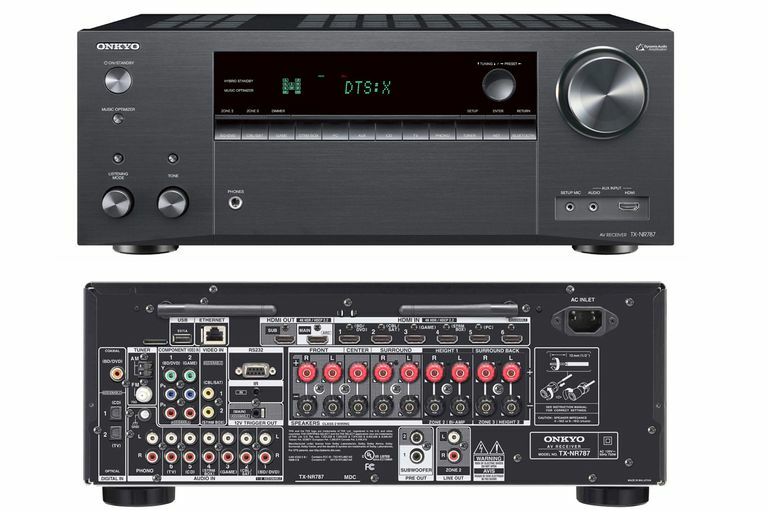 Higher-end home theater receivers offer an additional analog audio connection option, referred to as Multichannel analog audio connections. A separate connection for each channel of audio is provided. This means that just as there are left- and right-channel analog audio connections for stereo, for surround sound, it is possible to include separate analog audio connections for the center, left surround, right surround, and, in some cases, left surround back and right surround back. The connections use RCA jacks and cables. The most common multichannel analog connection option, which is found mostly on mid- and high-end home theater receivers are multi-channel analog audio outputs. These outputs connect a home theater receiver to external amplifiers. However, when multichannel analog preamp outputs are used, they disable the home theater receiver's internal amplifiers that are designated for the corresponding channels. You can't combine the power output of an internal amplifier with an external amplifier for the same channel. Some home theater receivers also provide Multi-channel analog audio inputs, but they are becoming very rare on newer models. If a home theater receiver has this option, it provides the flexibility to connect some DVD/Blu-ray disc players, or another source component that may offer this as an output connection option. Component Video: This is an analog video connection option that separates Luminance (Y) and color (Pb, Pr or Cb, Cr) into three channels, thus requiring three cables (colored red, green, and blue) to transfer video from a source device to a receiver or a TV. Component Video cables can transfer both standard and high-definition (up to 1080p) video signals. However, due to copy-protection issues, most sources now restrict signals passing through component video cables to standard definition. Composite Video: Composite video uses a single RCA connection (usually Yellow as illustrated in our photo example) to send the Color, B/W, and Luminance portions of an analog video signal from a source device to a TV or home theater receiver. Composite video signals are standard definition resolution analog signals. S-Video: Another type of video connection you might find if you have or purchase an older used home theater receiver is S-Video. The S-Video cable sends the B/W and Color parts of the video signal through separate pins within a single cable connector. This provides better color consistency and edge quality than the composite video option but has been superseded by both component and HDMI video connections. A USB port is provided on many home theater receivers. This allows you to both play music back stored on flash drives or other compatible USB devices, and, in some cases, allow you to power or charge your smartphone or another compatible device. A growing number of home theater receivers also provide network/internet connectivity. This can be provided via connection of an Ethernet cable the receiver via a provided Ethernet/LAN port. However, a growing number of home theater receivers provide both Ethernet and WiFi connectivity which provides added flexibility as to where you can place the receiver in relation to a broadband router. RS232 – Provides physical connection to a PC or custom home theater controller. IR Sensor Cable Input – If this is an input, you can connect an IR blaster cable so that the home theater receiver doesn't have to in direct line-of-side of your remote control. If this is an output, it allows the home theater receiver to blast an IR signal to control another receiver. 12V Trigger – This is a connector that allows the receiver to turn other compatible devices on or off, or start some functions, such as lowering or raising a video projection screen. Of course, you need the power to use a home theater receiver. For added convenience, most provide a power cord that plugs into an AC inlet or socket. In addition to all the connections on the rear panel, many home theater receivers have connections on the front panel as well. On some home theater receivers, these may be hidden by a flip-down door. HDMI input – This comes in handy when connecting temporary devices, such as some digital cameras, and sometimes smartphones. This definitely more convenient than trying to reach an HDMI input on the back of the receiver. 3.5 mm (shown in the photo) or RCA analog audio inputs. Mic Jack – Most home theater receivers include an automatic speaker setup feature that uses self-generated test tones. The mic jack is where you connect the mic to receive the tones that the receiver can then analyze and adjust your speaker levels in relation to your room size and acoustic properties. Headphone jack – This is usually a 1/4-inch type, but you can use an adapter if your headphones use 1/8-inch connectors. When headphones are plugged in, usually, the speakers are disabled. USB Port – ﻿Although not shown in our photo example, some home theater receivers may provide a USB port on the front panel for playing music stored on flash drives or connection with an iPod or iPhone. Composite Video Input – Not shown in our image, but some receivers include a composite video input on the front panel. Wireless Multi-room Audio (DTS Play-Fi, Denon Heos, Yamaha Musiccast, and others). Compatibility with Alexa and/or Google Assistant. Now that you know what all the connections are on your home theater receiver, you can more easily get it installed and set up. Multichannel Analog Audio Connections: What Are They For?